For some reason—I can’t recall ever making special note of the date before—I suddenly remembered this week that it was on February 15, 2005 that I boarded my first flight to China, leaving JFK for a long trip across the Pacific to study Chinese in Beijing. So today, the final day of the Chinese New Year vacation, is also the eighth anniversary of my first time in China. Only photo I can find on my computer from China in 2005. Minutes before my first (and so far only) hot-air balloon flight, in Yangshuo, Guangxi province. That explains the slightly panicked attempt at a smile. 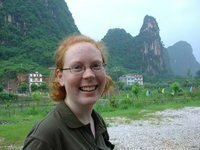 In 2005, I actually felt like I had kind of missed the boat on China being a truly adventurous or unique place to go. I read memoirs by Peter Hessler and Rachel DeWoskin, who had come to China in the early 1990s, and it seemed like they had really roughed it. They had moved to a country in the early stages of change: a China without Starbucks, where foreigners could not hold renminbi (they were supposed to use a currency called Foreign Exchange Certificates instead), and at a time when communicating with friends and family in the States wasn’t necessarily easy or cheap. Hessler, DeWoskin, and others of the 1990s China cohort had, in my mind, so much more street cred than I, with my emails and lattes, would ever be able to earn. I inexplicably worried that China had finished whatever transition it was going to go through, and I had missed it. Obviously, I was very wrong about that. China, and I, have both changed more in eight years than I could ever have imagined sitting on that Japan Airlines flight as it ascended from New York. But in some unexpected ways, life here now feels oddly unchanged from my early weeks in Beijing. I’ve been pondering this all day, and have put together a quick list of five things that are totally different since eight years ago, and five things that are much the same—though perhaps some change in those areas would be welcome. 1. On the whole, people pay much less attention to me now. With red hair and freckles, I used to feel painfully visible in Beijing, and had to grow used to people pointing and staring and asking to take photos with me. That rarely happens anymore, even in smaller, more rural places where foreigners are much less common than in my Shanghai neighborhood. People will often still express surprise when I speak Chinese, but they generally take my presence in the country in stride. 2. I no longer dream of salad. Look, I love dumplings and noodles and Xinjiang dinners and lots of other Chinese cuisine … but I also really love salads. And sandwiches. And Indian food. These used to be difficult to find (within my budget, at least) and of varying quality when I did track them down, but no longer. There were always a few places that foreigners could go to find the foods they missed from back home; now, in major cities like Beijing and Shanghai, those restaurants are all over the place and serve a variety of price points. It’s a different story when you go into smaller cities, but in general, the non-Chinese dining options here have multiplied and improved over the past eight years. If Trader Joe’s would open a Shanghai store, I’d be set. 3. I’m not tall anymore. I’m 5’6” tall, usually an inch or two more depending on which shoes I’m wearing. That’s a basically average height in the U.S., but here I used to feel like a giant among Chinese women. I still tend to tower over any woman older than 60 or so, and I’ll reliably be a couple of inches taller than women in their 40s. Put me in a crowd of women between 20 and 35 years old, though, and I’m once again average height. I presume this is due to changes in the Chinese diet during the 1980s and ’90s, but it’s pretty remarkable to see the differences among generations. 4. Real-time communication. I’ve remarked on this before, but it’s now incredibly rare for me to feel disconnected from what’s happening with my friends and family in the States, or anywhere else in the world. As long as my VPN is working (though there’s no guarantee of that these days), I can email, Skype, Facebook, Tweet, and watch the latest episode of The Daily Show. Even in 2005, keeping in touch with people and staying on top of American news and pop culture was much more difficult, and it always involved some amount of lag time. That’s largely vanished. 5. In some ways, China is getting pricey. Back in 2005, when a dollar was worth 8.2RMB and prices were low, my classmates and I were constantly amazed at how cheap living in China was. That’s no longer the case, now that the exchange rate has fallen to about 6.2RMB/dollar and inflation is causing prices to rise. I used to hoard my 100RMB bills, feeling like there were few things that could convince me to part with all of one at once. Now I’m surprised if I make it out of the grocery store with a bill under 200RMB for the week. And let’s not even talk about the price of a decent cup of coffee here. 1. But in most ways, China is still less expensive than the U.S. Whenever I start to worry that living here costs more than I’d expected, I remind myself of a few things: cheap bus/taxi/subway rides, inexpensive train tickets, $3 dumpling feasts, cheap DVDs (ahem), and so forth. Though my rent is just about the same here as it was for slightly less square footage in Princeton, my other living expenses are, on the whole, lower. And I can afford to travel far more here than in the U.S. or elsewhere. 2. Bureaucracy and illogical rules still vex me. I had to open my suitcase in the Haikou airport on Wednesday night and explain to a security guard why I had knitting needles and a pair of scissors inside, which for some reason he thought might not be allowed in a checked bag. He eventually let me leave them in, but we had a surprisingly long conversation about it. I have to go for a new visa next week, which I’m dreading because I know it will involve a long line and (probably) at least one thing that I thought I’d done right that the clerk will deem wrong. (Keep in mind that I’ve applied for about a dozen visas in the past eight years and am not unfamiliar with the process.) Shanghai and Beijing have recently declared that people can visit the cities for three days without visas; I’m desperately hoping for the day when they extend that to six months. 3. Celine Dion is still popular. So are the Backstreet Boys. Both performed on New Year’s television specials last Saturday night, though I was mercifully on a plane to Haikou and missed them. At least twice in recent months, I was in earshot of cell phones with “My Heart Will Go On” as their ringtone. I thought it was kind of funny back in 2005 that these artists were still hot in China after their popularity had waned in the U.S. Now I’m just mystified. 4. China attracts a lot of great writers. If there was one single thing that drew me to China, it was reading one fantastic book about the country after another. That hasn’t changed at all, and my early favorites (Hessler, Jonathan Spence, Paul Theroux) have been joined by a list of excellent newspaper and magazine writers, radio journalists, and bloggers far too lengthy to name here. I think China writing is getting better and better as the years go by, and I look forward to reading what comes next. 5. Chinese is still So. Damn. Hard. * To whatever extent I imagined my life in 2013 back in 2005, that future probably involved perfect fluency in Chinese. Eight years? Eight years is more than enough to learn a language when you live in the country for almost half that time. Yeah … not Chinese. I definitely have far more good days than bad at this point, but I’m still discouraged when I find myself unexpectedly tongue-tied or looking up a character that I sort of recognize but can’t remember. Give me another eight years and maybe I’ll have this Chinese thing down one day. I hope. *If you click on only one link in this blog post, make it this one. It’s a classic essay by David Moser on the joys—and sorrows—of learning Chinese. A long read, but very worth it for anyone who struggles with the language. Congratulations on your China-versary.. I was not aware of the Foreign Exchange Certificates.